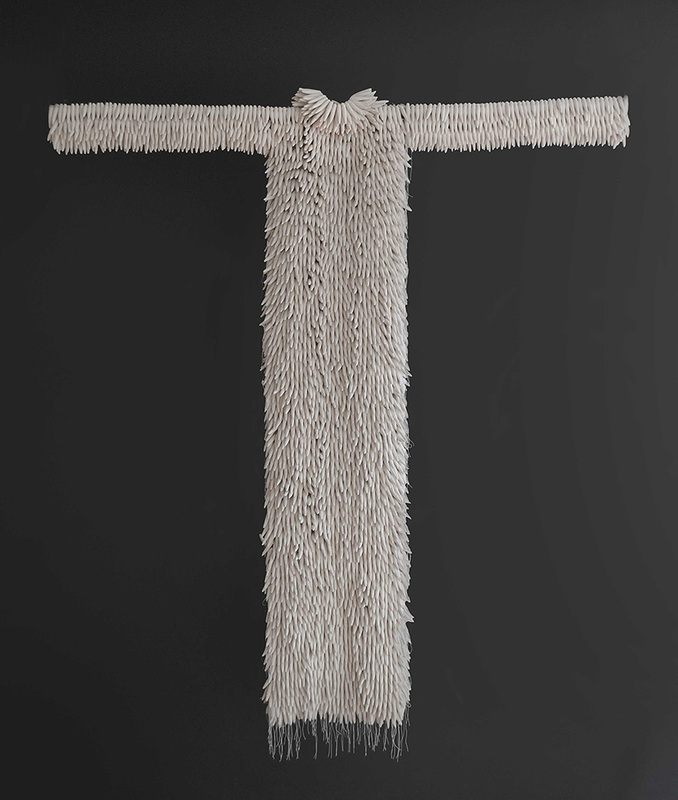 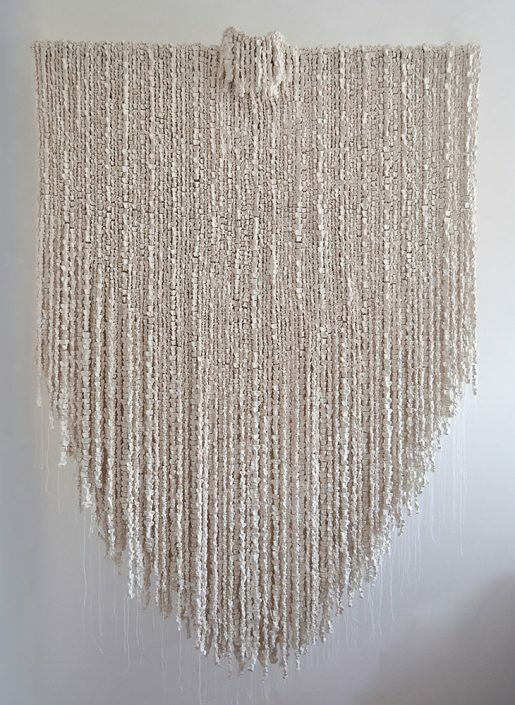 The works of Mexico-based artist Xawery Wolski and Arizona-based installation artist Alan Bur Johnson draw poetry from the atmosphere in works that are meditative and exacting. Using familiar forms and materials that interact with the ambient qualities of their surroundings, Wolski and Johnson delineate ethereal figures in space and time that bear the weight of human memory. 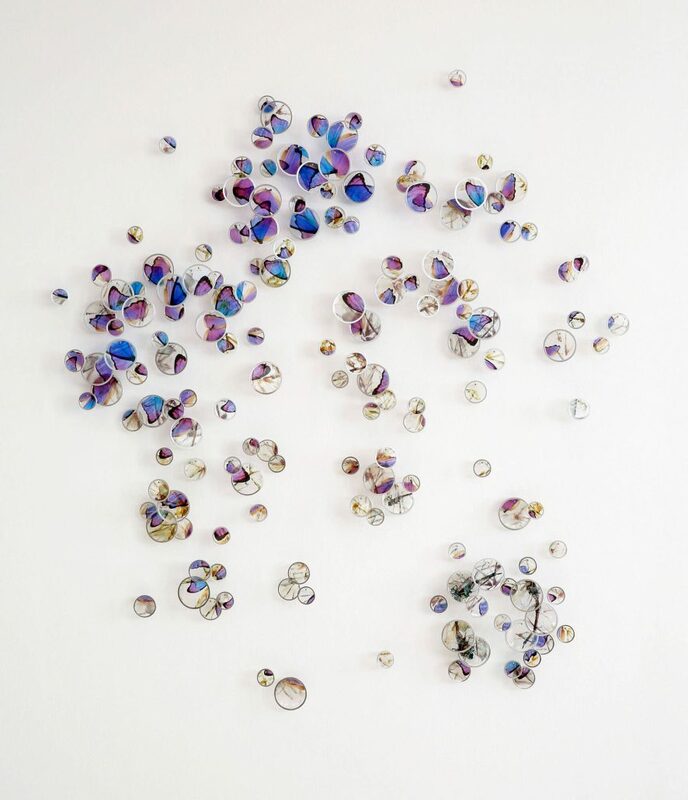 New works by both artists are featured in Lisa Sette Gallery’s fall exhibit. 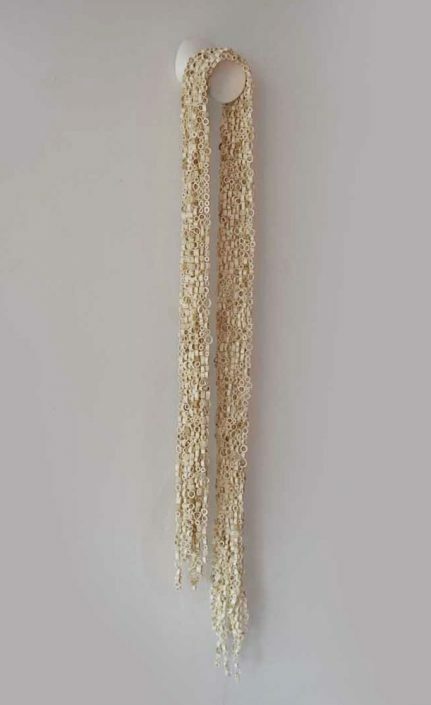 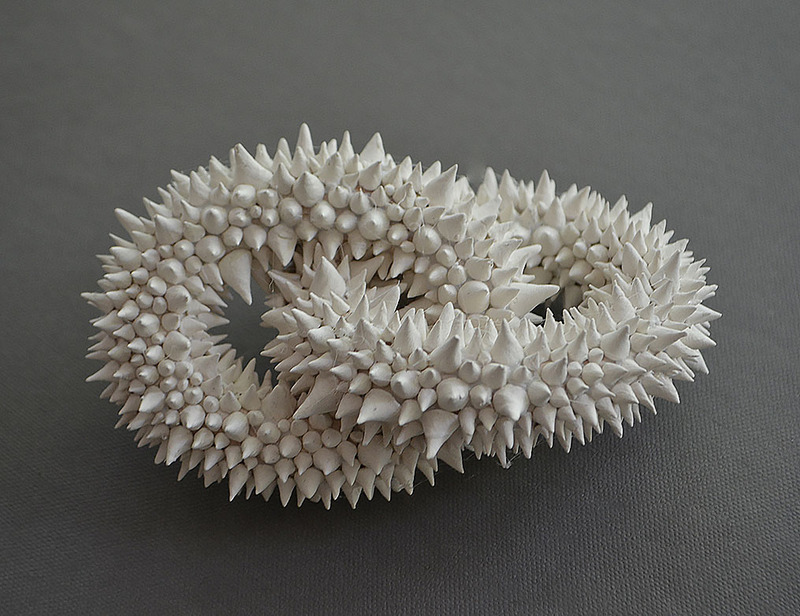 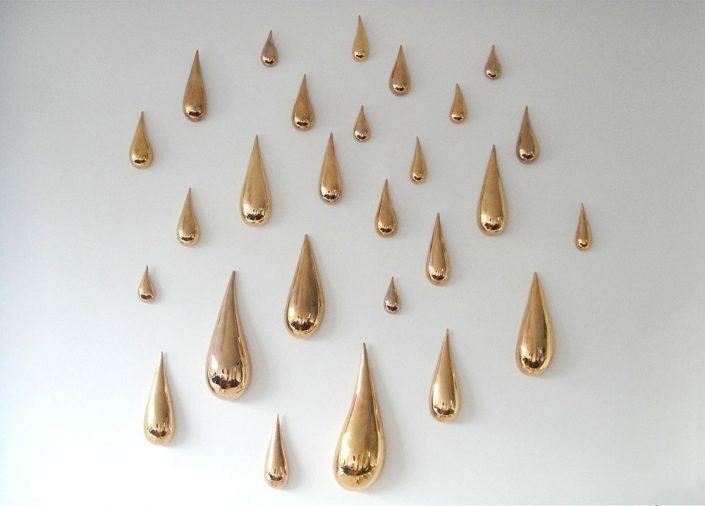 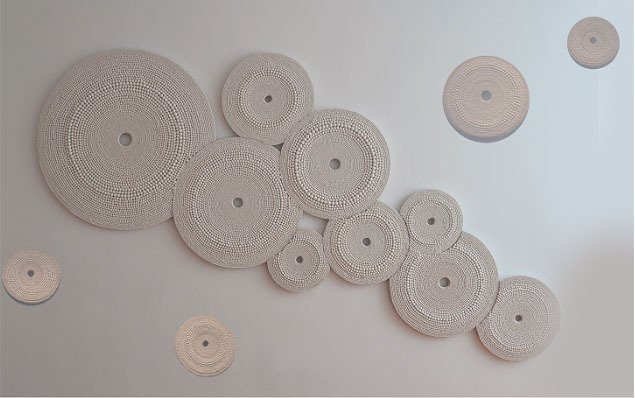 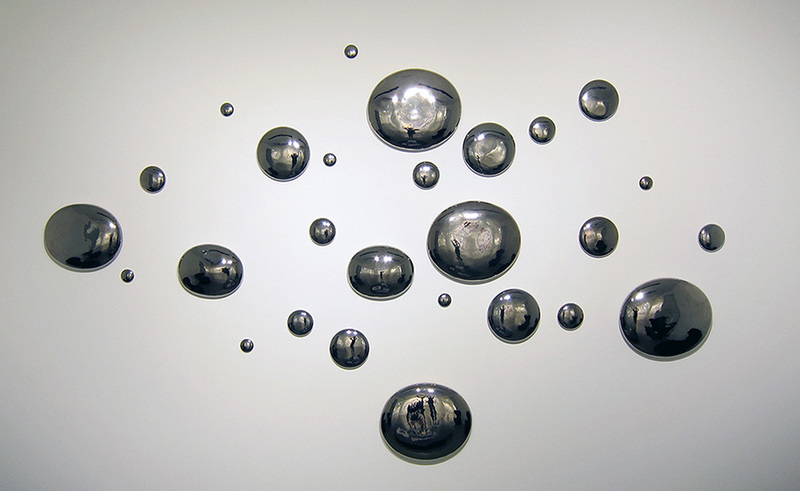 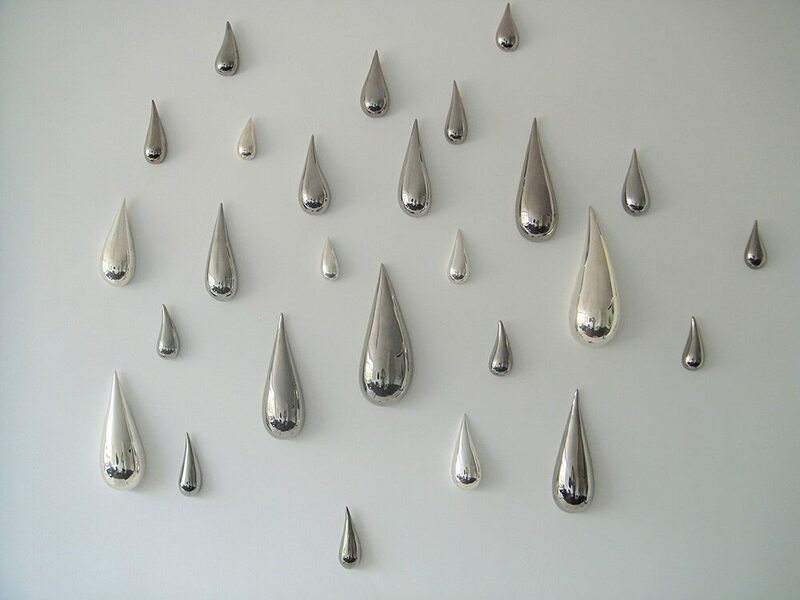 In a related body of work, Wolski arranges glistening, highly-glazed clay components resembling liquid droplets in precise, jewel-like formations against the wall. Wolski travels widely in the Americas and obtains a clay sample from wherever he goes: “the clay comes from the earth, and the earth is the material of origin: the essence of the place where we come from and where we end.” Reflective and highly responsive to light, these works glimmer and morph in response to the changing light and human presence in the gallery, speaking an ancient and atmospheric language that extends beyond our brief moments of perception. 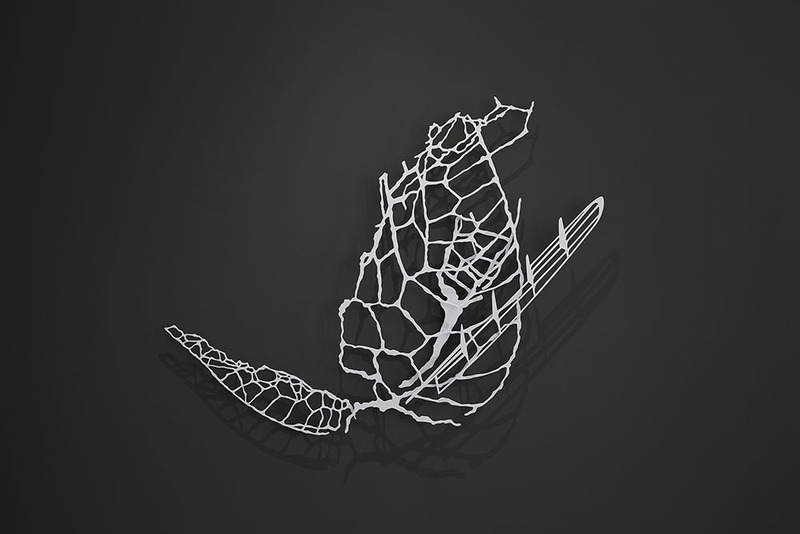 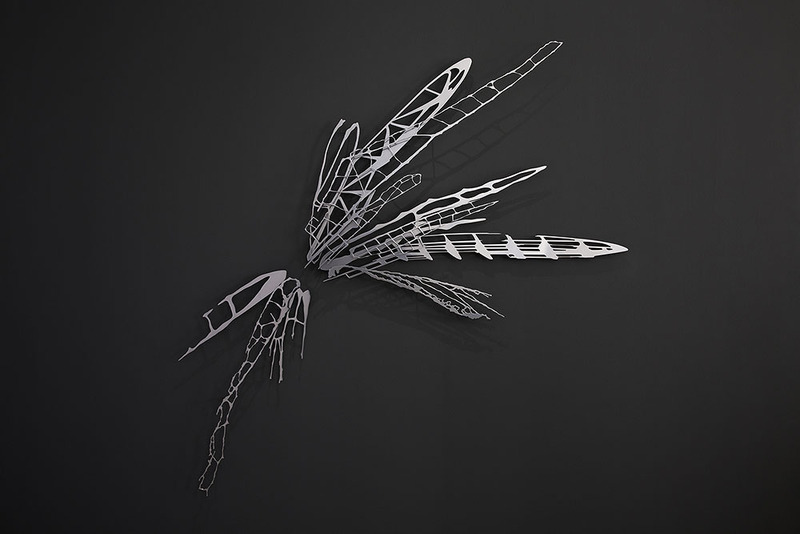 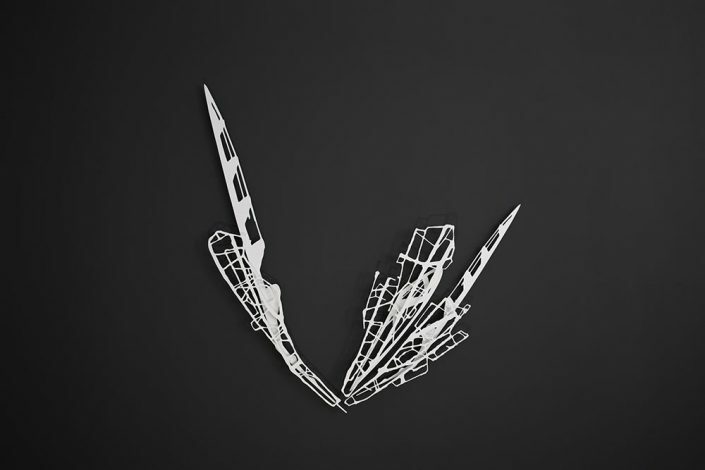 Johnson records the projected silhouettes of both human aircraft and insect anatomies, then assembles the resulting pieces into large, powder-coated steel structures as delicate as lacewing, and that, when installed, project their own shadow chronology in the changing light. 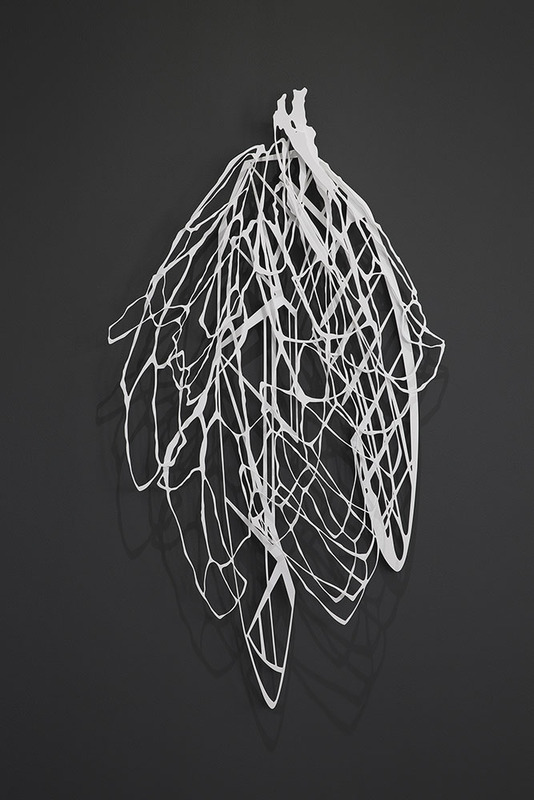 From a fragmentary epiphany distilled in the desert air, Johnson’s works speak to the variance and convergence of biological systems and human endeavor. Systems of memory and flight combine to give shape to a shared consciousness, a knowledge of our place in the world that is embodied by the structures we ourselves are in the constant process of creating and disassembling. 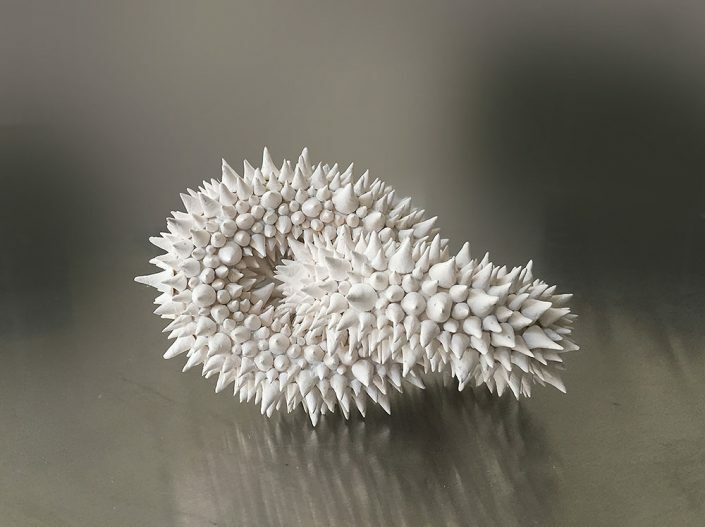 Johnson’s particular scientific and poetic ingenuity is in expressing the volume of absence in these forms, and the mysterious, ever-present existence of emptiness and release within our busy moving parts. 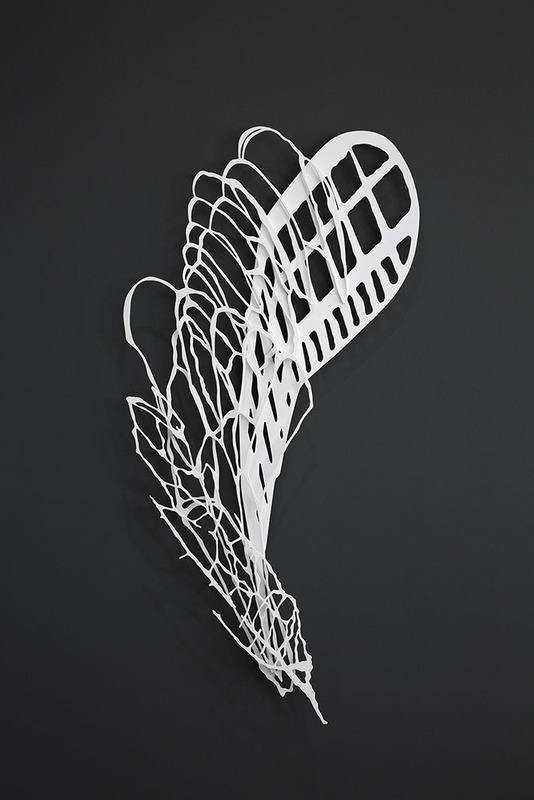 Push the Sky captures the shadow-impression of the fluttering and darting wing, at the moment it comes to rest.